This is a follow up from my first blog titled Steven Dux and Memorization. In that first blog post I made the case that Mr Dux likely uses some sort of memorization as part of his study technique and why this makes sense. If you haven’t read that post I suggest you do before carrying on. This blog will address the comments I received in the first blog and then further make the case for memorization. The two main comments I received regarding memorizing were that: the markets and patterns change, and memory fades. Both of these points are valid and true but they are not fatal to using memorization as a study tool. Before I address these comments directly, I’m going to reveal the best method in my opinion to memorizing what you learn about stocks. Memorization is powerful because it gives you experience in a more efficient way and it also helps to develop an ‘instinct’ towards a chart pattern that is developing. 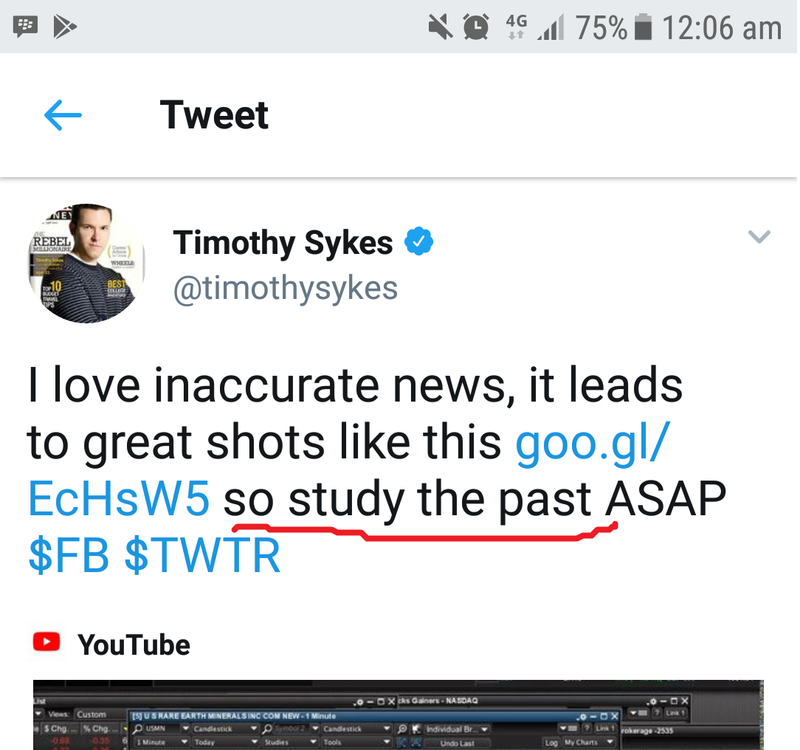 Sykes regularly mentions that he is a ‘history’ teacher and it is best to trade ‘gimmies’. Gimmies are easy because they are predictable and they are predictable because he has seen the same thing (albeit with modifications) happen over and over and over again. So if you are just setting out and don’t want to spend the next 15 years to learn these patterns or gain the experience to spot them then memorizing previous patterns is a good idea. I’m not a teacher by profession but when I think about memorizing I think back to when I used to revise for spelling tests in school. I would write out lines over and over until it would stick. I would then say it out loud over and over until it stuck further. Effectively, I would think that memorizing effectively means repetition. I’m bit of a perpetual student in life but I’m not fortunate to have a photogenic (or anywhere near) memory. Repetition for me works best when combined with actually doing. So how do we apply this to stocks then? Well, you can watch videos over and over. Draw out chart patterns and write down the lessons of those plays over and over. However, I suggest that flash cards are a good method. The traditional flash card is where you have a note card (small rectangular stiff piece of paper often used for public speaking) and on the front is perhaps a term and on the back is the answer. This is an excellent technique as you are testing your ability to recall specific information. So in theory, you could have a relevant market term on the front with the definition on the back. Or, you could have a chart pattern on the front, plus relevant commentary on the back, the goal being able to identify the relevant lessons from the chart pattern on the front. Mr Dux commented on my first blog post. He’s made an excellent point that whilst memorization is useful memory ultimately fades. However, there is a simple method to largely prevent memory fade. The relevant technique is called Spaced Repetition Learning. The idea is when you learn something, there is a lined curved downwards of when you will be able to recall that information. In other words, after x amount of time your ability to recall that learned information may decrease by y amount. Therefore by reviewing it at intervals you are able to extend the length of time you can recall that set of information. It is spaced repetition learning that has been the key to my academic achievement and now hopefully the key to understanding this stock niche. The other criticism/comment from my first blog was that the market always changes and therefore (I would assume the argument flows) memorizing patterns is either not effective or even possibly counterintuitive. This point is correct to a degree. The market is always changing. However, what is actually meant by patterns? When I say use memorization to learn the patterns of stocks I’m not suggesting you print of charts and start drawing them out over and over until you can draw them from memory. I interpret the use of the word ‘patterns’ in stocks to mean a set of rules, conditions and outcomes. The best way to explain this is with an example. Let’s take stock pattern ABC. Pattern ABC is the new hot pattern in small/micro and nano cap stocks. Everyone loves pattern ABC. However, for something to be pattern ABC it must have certain rules and sometimes there are other optional conditions (read this as an option). Stock 1: rules 1-3 are true but no conditions are present. The result is outcome 1. Stock 2: rules 1-3 and condition 2 present. The result is also outcome 1. Stock 3: rules 1-3 and conditions 1 and 2 are present. The result is outcome 2. So when I say memorize patterns I mean learn what must be true (or is highly likely as this is after all an odds based game), what is conditional (optional) and what the likely outcome is a result of that. When you were in school in math/science class you would learn some equation, practice it and then the teacher would tell you what the exceptions were to the rule to everyone’s dismay. The same applies here. If the market changes and you notice that pattern ABC is not working, or a lot of them are using condition 2, or perhaps the rules are not being met but the outcomes keep being true- then you update your knowledge account. In my next blog I will talk about how I used flashcards, what tools I use to manage my information and my general learning strategy.